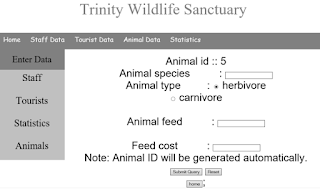 This is a free DBMS mini project on Wildlife Sanctuary Management System using back-end MongoDB as a database, front-end Php and HTML. In this project we have created one application which is easy to access and user friendly. For this application we used the backend as Mongo DB to store the data which is used in the application and for the user interface we have used the PHP and HTML. The staff is able to access this application. 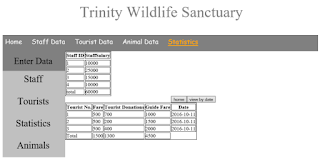 The purpose of this application is for smooth administration and to get a brief idea of overall expenses and profit the sanctuary deals with. The application keeps a backup of the tourist data which includes their ticket details, the fare they pay and the donations they make out of good heart for the welfare of wild animals and different initiatives. This report discusses the result of the work done in development of “Wildlife Sanctuary Management” on “PHP” as the Front-end Platform and “Mongo DB” as the back-end Platform. At the development of an application PHP provides a good connecting facility between all pages, also the back-end Mongo DB is most important to save all the data related the application. The definition of our problem lies in manual system and a fully automated system. Manual system: The system is very time consuming and lazy. This system is more prone to Errors and sometimes the approaches to various problems are unstructured. Technical system: With the advent of latest technology if we do not update our system then Our business results in losses gradually with time. The technical systems contains the tools of latest Trend i.e. computers printers, fax, Internet etc. The systems with this technology are very fast, Accurate, user-friendly and reliable. Specifying the Application and various components of the Architecture. The scope of the project is clear to give a simple and attractive application to simplify the work as well as to reduce the efforts while doing it offline or we can say by doing it with old methods. 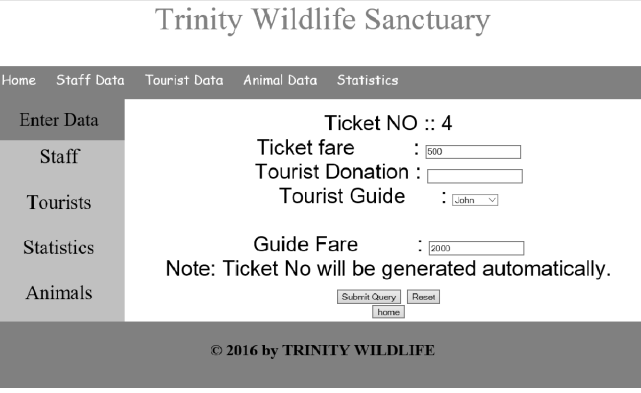 In this application we are able to save the database of all the staff, animals need and tourist data. 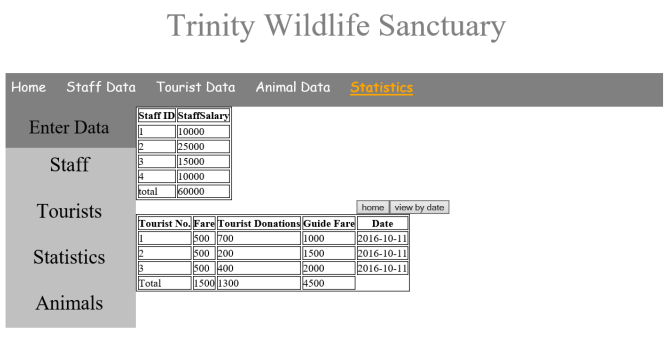 The staff data includes the staff profession and their salary details, the animal data includes the type of animal (either herbivore or carnivore) and their feed cost, tourist data includes the ticket details and the donations they make. We are going to perform the project on windows platform so we need the OS as windows. Any version of windows as windows XP, windows 7or windows 8.The system should have minimum ram of 256MB as well as minimum storage capacity of 15GB. The system should contain the server software named as “EasyPHP” of version 14.1VC11. And mongo DB of version 2.6.3 or above. First we have to install both software and we have to do connectivity between them by changing the configuration file of “EasyPHP”. The application is very user friendly and uses a GUI interface implemented in PHP and HTML to Communicate with the user. Various features are self – explanatory. Forms are easy to fill in and components can be added, removed and updated very easily through a Single dialog box. The application includes tool-tip hints to give a brief description of the particular input Field. List boxes are used to display all the components at once so that user can see all the components of a Particular type at once. One can just select the component and modify and remove the component. (based on the access control of the person). Clean separation of various components to facilitate easy modification and revision. THUS WE HAVE SUCCESSFULLY IMPLEMENTED ZOO MANAGING DATABASE WHICH HELPS US IN ADMINISTRATING THE DATA USED FOR MANAGING THE TASKS PERFORMED IN A WILDLIFE SANCTUARY. WE HAVE SUCCEFULLY USED VARIOUS FUNCTIONALITIES OF MONGODB AND PHP AND CREATED THE FULLY FUNCTIONAL DATABASE MANAGEMENT SYSTEM FOR WILDLIFE SANCTUARY. Can you please send me the 0 LEVEL and 1 LEVEL DFD for the project ..